A field experiment was conducted to determine effects of pruning time and bud number on vine recovery and performance following cold injury to trunk tissues. Own-rooted Merlot grapevines planted in 1999 and trained to a bilateral cordon with vertical shoot-positioning were pruned in 2003 and 2004 as follows: prebudbreak spur pruning, postbudbreak spur pruning, prebudbreak spur pruning with late repruning (double pruning), minimal pruning, and minimal pruning with disbudding of all nodes. On average, 25% of buds were killed by cold temperatures in late fall. Trunk injury, rated as tissue browning on adjacent vines, varied from 20 to 100% phloem injury with little xylem injury. Phloem injury had virtually no effect on budbreak, growth, fruiting, and fruit composition in the two following seasons. Differences in bud number per vine due to pruning treatment led primarily to equivalent differences in shoot numbers, cluster numbers, and yield. Minimal pruning resulted in the highest yield in both seasons, while double pruning and disbudding resulted in the lowest, but even disbudded vines grew fruitful shoots from basal and latent buds. Overall yields were low and fruit composition was unaffected by the pruning treatment, although soluble solids was negatively correlated with yield. Despite the two warm seasons, most of the vines, including those with high shoot and cluster numbers, did not collapse later in the season. Results indicate that pruning time and bud number did not influence vine survival and recovery from cold injury and had little effect on subsequent growth and vine performance. Grapevines acquire cold hardiness, or freezing tolerance, during cold acclimation in fall and hardiness becomes maximal in midwinter. Cold acclimation is initiated by a combination of decreasing day length and cooling temperatures in late summer (Schnabel and Wample 1987). Acclimation accelerates following brief episodes around 0°C, and cold hardiness then fluctuates throughout the winter, generally tracking changes in temperature (Mills et al. 2006). Thus, shorter days alone, while inducing dormancy and periderm formation (“shoot maturation”), are insufficient for Vitis species to cold-acclimate (Schnabel and Wample 1987, Fennell and Hoover 1991), which may cause problems when a sudden freezing event follows a very mild fall, especially on cultivars that are slow to harden off. The growing season in southeastern Washington is characterized by high irradiance, warm days, and cool nights (mean seasonal diurnal temperature range 16.5°C), with a long-term (1954–2005) average heat accumulation (growing degree days, base 10°C) of 1344°C d, extremely low rainfall (200 mm per year with only 90 mm from April through October), and high evaporative demand of the atmosphere (evapotranspiration, ET0 of 1190 mm per year with 1020 mm from April through October). One key challenge facing growers in this region is the occasional occurrence of very cold winter temperatures leading to cold injury in grapevines. Cold injury contributes to substantial seasonal variation in yield and fruit composition and, if severe enough, may force retraining of vines from the ground up (Clore et al. 1974, Keller et al. 2005). Although the vast majority of grapevines in Washington are currently planted on their own roots, retraining is labor intensive and is associated with major capital expenses and temporary shortages in grape supply for the wine and juice industries. Knowledge of the factors contributing to the alleviation of cold injury could lead to changes in vineyard management and a better matching of planting material to particular sites, which would reduce spatial and temporal variation in yield and fruit composition, improve harvest planning, and facilitate marketing. Recovery of grapevines from cold injury to canes, cordon, and trunk depends on the ability of vines to reactivate the vascular cambium for renewed cell division and to repair injured phloem tissue. Normally the reactivated phloem from the previous season is important during the early growth period before it is discarded and replaced with newly formed phloem (Esau 1948). Phloem reactivation appears to be stimulated by release of the growth hormone auxin from swelling buds in spring (Aloni et al. 1991, Aloni 2001) and progresses up and down the cane from each bud and outward from the vascular cambium (Aloni and Peterson 1991). Simultaneously with or soon after the phloem, the cambium also resumes its function. This cambium reactivation, which also is induced by auxin released from the buds, is thought to commence in the distal buds, progressing basipetally and laterally around the cane and trunk until the enlarging discontinuous patches meet (Esau 1948). The restoration of xylem function, on the other hand, is related to a phenomenon called “bleeding,” or exudation of xylem sap from pruning surfaces, which signals the transition from dormancy to active growth. Bleeding is caused by root pressure (Priestly and Wormall 1925, Alleweldt 1965, Sperry et al. 1987), which is brought about by remobilization of nutrient reserves in the vascular tissues (Campbell and Strother 1996), leading to high osmotic pressure and, consequently, water uptake from the soil and lifting of this water to the buds. Root pressure dissolves and pushes out air bubbles that have formed during the winter in the dehydrated xylem and may also be essential to rehydrate dormant buds to enable them to resume cell division and break. Bud moisture content increases rapidly (within days) from ~50 to 80% before bud-break (Lavee and May 1997). If the vascular cambium is reactivated during bud swelling by bud-derived auxin, then one potential strategy to overcome severe phloem (and perhaps xylem) injury is to delay winter pruning until after budbreak to maximize auxin production. Higher bud numbers might increase total auxin availability, thus delaying pruning until after bud-break could enhance the restoration of cambium function following cold injury to canes or trunks. Relatively severe pruning after budbreak (depending on the extent of damage) and/or shoot thinning, thereby reducing the transpiring leaf surface, could then minimize later collapse of the vine due to extensive water loss (Wolfe 2001). An unusually severe fall freeze of −11.5°C on 31 Oct 2002 caused cold injury to grapevines throughout southeastern Washington, as vines had not yet become fully cold acclimated. A similar, albeit less severe, freeze occurred again in the following season (−8.7°C, 31 Oct 2003) and was followed by another low-temperature event in midwinter (−21.7°C, 5 Jan 2004). These freeze events enabled us to conduct a pruning experiment in a Washington vineyard to test the hypotheses laid out in the preceding paragraph and to determine the effect of pruning time and bud number on vine recovery and performance. A pruning experiment was conducted in a Vitis vinifera L. cv. Merlot vineyard (46°17′49″N; 119°44′07″W; elevation 364 m) at the Irrigated Agriculture Research and Extension Center, Prosser, Washington. The own-rooted vines were planted in 1999 in north-south-oriented rows on a ~2% south-facing slope and spaced at 1.8 m (within rows) by 2.7 m (between rows). They were trained to a bilateral cordon (90 cm aboveground) with loose vertical shoot-positioning (one pair of foliage wires); no shoot thinning or other canopy management practices were applied during this study. The vineyard was drip-irrigated using regulated deficit irrigation followed by refilling of the soil profile after harvest to prevent cold injury to roots as described elsewhere (Keller et al. 2005). Pruning treatments were imposed on the same vines in 2003 and 2004 in order to vary bud number and pruning time: standard spur pruning (prebudbreak, early March), late spur pruning (postbudbreak, mid-May), standard spur pruning with late repruning (double pruning, early March and mid-May), minimal pruning (no pruning except trimming of dead cane ends to facilitate bud counting), and minimal pruning with disbudding of all nodes (buds sliced off with a grafting knife). Bud numbers retained after pruning are presented in Table 1⇓. Standard spur pruning served as a control, although it was obviously impossible to include a true control consisting of vines that did not have any cold injury. Late spur pruning was done to maximize the number of buds available to break (and hence release auxin) and then limit canopy size to be the same as the control. The double-pruning treatment was imposed to severely restrict canopy size (i.e., shoot number) to prevent vine collapse by removing at least half of the spurs after budbreak. The disbudding treatment was designed to minimize vine recovery (“negative control”); it attempted to simulate 100% bud damage while maximizing the amount of cold-injured wood. Effect of pruning treatment and time on the number of buds retained after pruning and on yield formation of cold-injured Merlot grapevines. The experiment was conducted in two adjacent rows within the vineyard, using a randomized complete block design with treatments replicated in three blocks of three to four adjacent vines (10 vines per treatment). At the time of the first pruning, trunk injury was assessed by rating the extent of oxidative browning in the phloem and xylem visible in progressively deeper vertical tangential cuts of ~5 cm length on both the southeast and the southwest side of the trunk between 30 and 60 cm above-ground. Tissue browning is generally caused by membrane failure and oxidation of cellular phenolic components and is considered to indicate lethal injury to tissues (Stergios and Howell 1973, Hong et al. 1980, Pierquet and Stushnoff 1980, Malone and Ashworth 1991, Fennell 2004, Mills et al. 2006). Cuts were made on the two vines immediately north and south of each group of treatment vines to avoid interfering with potential recovery of the treatment vines. In 2003 bud damage was estimated from the proportion of buds that broke in the standard spur-pruning and double-pruning treatments. Bud damage in 2004 was assessed before budbreak by visual examination of longitudinal cuts through 100 buds collected from surrounding vines in the same vineyard. Growth, yield formation, and fruit composition were monitored during the 2003 and 2004 seasons. All vines were harvested on the same day within a season, and clusters were counted and weighed. A 100-berry sample was removed from each vine and processed on the same day to determine fruit composition (soluble solids, titratable acidity, pH, and color) as described by Spayd et al. (2002). Shoot periderm formation (cane maturation) was assessed at harvest by counting the number of internodes with brown periderm as well as the total number of internodes on each of three shoots per vine. In addition to the node count at harvest, canes were counted in late winter as a measure of seasonal growth, but pruning weight was not recorded as it is not a suitable indicator of vine size for minimally pruned vines. Meteorological conditions were monitored using data collected by the Washington State University Public Agricultural Weather System (WSU-PAWS) northern Prosser weather station. Heat accumulation (growing degree days, GDD) for the period 1 Apr to 31 Oct was calculated from daily mean temperatures, using a base temperature of 10°C. The Statistica software package (version 7.0; StatSoft, Tulsa, OK) was used for data analysis by analysis of variance and correlation. Duncan’s new multiple range test was used for post-hoc mean comparisons of significant treatment differences. The unseasonably low temperature on 31 Oct 2002 (Figure 1⇓) caused relatively extensive trunk injury (phloem browning) but only slight to moderate bud damage in field-grown Merlot vines. While about 25% of the primary buds were killed (range 0 to 50%), trunk phloem injury was 67% on average but ranged from 20 to 100% brown phloem tissue (Figure 2⇓), which often seemed to effectively girdle the trunk, especially near ground level. The severity of trunk injury increased down a slight (~2%) slope in the vineyard; vines toward the lower-lying southern end, which had restricted cold-air drainage because of an unharvested corn field, sustained more phloem injury than those toward the northern end (Figure 2⇓). A partial explanation for the discrepancy between trunk injury and bud damage may be that temperatures near the ground are generally somewhat colder than around the buds (cordon level and higher). Although temperature profiles were not measured in this study because the cold event had not been expected, the survival of Merlot scions in an adjacent rootstock trial field-grafted in 2002 increased strongly with increasing grafting height aboveground: survival was 69% at 69 cm (n = 180) but only 40% at 28 cm (n = 192) (M. Keller and L.J. Mills, unpublished data). In addition, in contrast to the situation in midwinter, lethal temperatures for buds during cold acclimation are often lower than those for phloem, although not as low as xylem lethal temperatures (Wample et al. 2001). For instance, long-term evaluation of cold hardiness in our laboratory showed that phloem injury of Merlot in late October typically starts at temperatures that are ~2°C higher than the temperature at which 50% of the buds are killed and ~7°C higher than the temperature at which phloem injury is complete and xylem injury starts (L.J. Mills, unpublished data). Given these differences in phloem injury and bud damage combined with the insignificant xylem injury in 2002, these vines provided excellent testing material for the hypothesis that trunk (phloem) recovery might be altered by varying bud and shoot numbers before and after budbreak due to variation in auxin production (Lavee and May 1997). Although this experiment did not include an injury-free control treatment in 2003, one could argue that this control was provided in the following season. Cold damage from low temperatures in late October 2003 and early January 2004 was minimal: on average the vines sustained only 2% bud damage and <10% phloem injury throughout the experimental block. 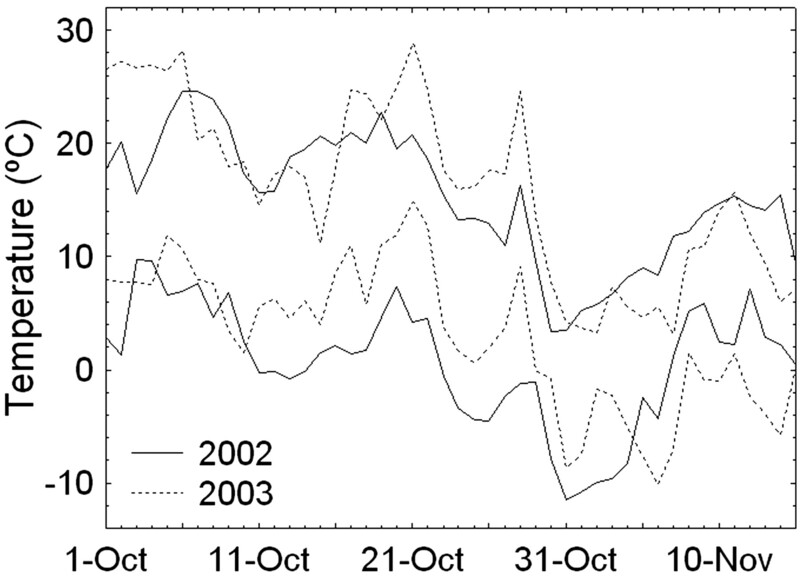 Temperatures in late fall were slightly higher than in 2002 (Figure 1⇓), and there was no barrier to air drainage. Daily maximum and minimum temperatures for the post-harvest period of Merlot grapevines in the Yakima Valley, Washington, 2002 and 2003. Effect of unseasonably low fall temperature (−11.5°C on 31 Oct 2002) on the extent of oxidative browning of the trunk phloem of Merlot grapevines grown in north-south oriented rows down a ~2% slope (vine position refers to the vine number within a row). As intended, the pruning treatments established differences in compound-bud numbers (Table 1⇑) and led to a wide range of 0 to 186 buds per vine (not counting basal or latent buds). Budbreak occurred around 28 Apr 2003 and 17 Apr 2004. The proportion of buds that broke ranged from 50 to 125% (i.e., there was some shoot growth from noncount basal and latent buds), with means of 90% for the two treatments that were pruned before budbreak and 65% for the two treatments pruned after budbreak or not at all (no budbreak percentage was calculated for the disbudded vines). However, neither the range of phloem injury nor the variations in bud or shoot numbers led to differences in vine recovery over the two following seasons. For instance, there was no relationship between the gradient in phloem injury along the rows (Figure 2⇑) and any of the vine growth and cropping factors measured. Indeed, in 2003 the group of four minimally pruned vines located in the most severely affected portion of the vineyard produced the highest yields of all vines. Moreover, the nonexperimental vines with multiple trunk wounds inflicted during the cold-injury assessment also recovered fully. Even completely disbudded vines grew up to 25 vigorous shoots from basal buds on the canes and latent buds on the cordon, and many of these shoots were fruitful (mean 0.9 clusters per shoot). Only two of the disbudded vines died to the ground (i.e., no budbreak) in 2003 but grew back from suckers in 2004. One of the late-pruned and two of the minimally pruned vines collapsed (all leaves suddenly wilted) during the 2003 season but later recovered, although the minimally pruned vines lost their crop that year. One disbudded and one minimally pruned vine died back in 2004, but so did several of the spur-pruned vines that were not included in this experiment in the same vineyard. Moreover, none of the vines that temporarily or permanently collapsed was directly adjacent to any of the vines with the most severe (i.e., 80 to 100%) trunk phloem injury. Therefore, vine collapse did not appear to be related to either phloem browning or pruning treatment, but may have been caused by local differences in soil moisture. Neither late nor double pruning improved vine recovery compared with the other treatments, although late and double pruning should have maximized auxin production. 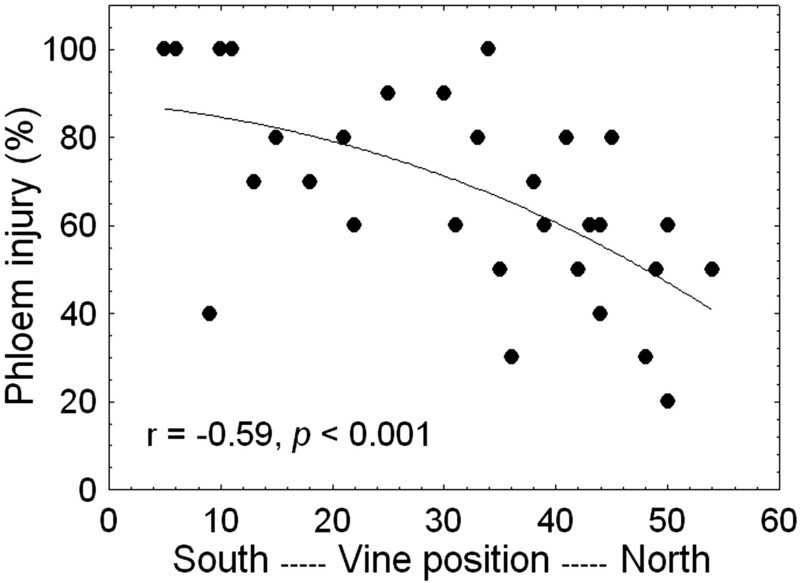 For the majority of vines, pruning-imposed differences in bud number per vine simply resulted in equivalent differences in shoot numbers (r = 0.96, p < 0.001). Lightly pruned vines tend to develop a larger canopy (i.e., leaf area) early in the season that effectively intercepts more sunlight (Weyand and Schultz 2006). However, this increases not only whole-vine photosynthesis but also transpiration rates (Gómez del Campo et al. 1999), making such vines more vulnerable to water stress. Nevertheless, despite the two very warm seasons (1617 GDD in 2003 and 1543 GDD in 2004) leading to high evapotranspiration rates (1074 mm in 2003 and 1004 mm in 2004), most of the minimally pruned vines with high shoot and cluster numbers showed no signs of water stress later in the season. This is in agreement with observations that increasing bud numbers left to compensate for severe cold injury during winter 1996 in Washington did not lead to vine collapse (Wolfe 2001). Reactivation of live phloem in V. vinifera occurs around the time of budbreak, with cambium reactivation following about two weeks later (Esau 1948). Trunk repair is generally thought to require at least a few surviving buds in addition to some live cambium or vascular tissue (Pratt and Pool 1981, Goffinet 2001). Therefore, our finding that vine recovery was independent of the number of retained buds and also occurred in completely disbudded vines might be explained by activation of surviving latent and basal buds, which could have been sufficient for cambium reactivation by bud-derived auxin. It is noteworthy that starch was remobilized from grapevine trunk xylem parenchyma even when the phloem and cambium had been completely destroyed (Winkler and Williams 1945). It is highly likely that such starch remobilization also occurred in the cordons and canes, with the resulting sugars being supplied to the emerging shoots via the xylem. However, the phloem injury in the present study (Figure 2⇑) would have made rapid cambium reactivation and growth of new phloem in spring critical. Active phloem has recently been found in laurel (Laurus nobilis L.) to be necessary for recovery from water-stress-induced xylem cavitation (Salleo et al. 2006). Although it is not known whether this is also the case in Vitis spp., grapevine shoots appear to be quite susceptible to cavitation and subsequent leaf wilting (Schultz and Matthews 1988). Consequently, if the phloem cannot be repaired or replaced by the time root pressure ceases to drive water flow up the vine, the injured vines could be vulnerable to canopy collapse during water stress. We hypothesize that rapid phloem recovery or reactivation might serve as an “insurance policy” against canopy collapse. Nevertheless, despite the death of many adjacent newly grafted vines, it may be possible that even when 100% of trunk phloem was discolored (oxidative browning), some of the phloem may have survived the injury. Since we are not aware of any evidence showing that brown phloem can be repaired rather than being replaced by new phloem, it is still uncertain how much (if any) live phloem a vine really needs at the beginning of the season. 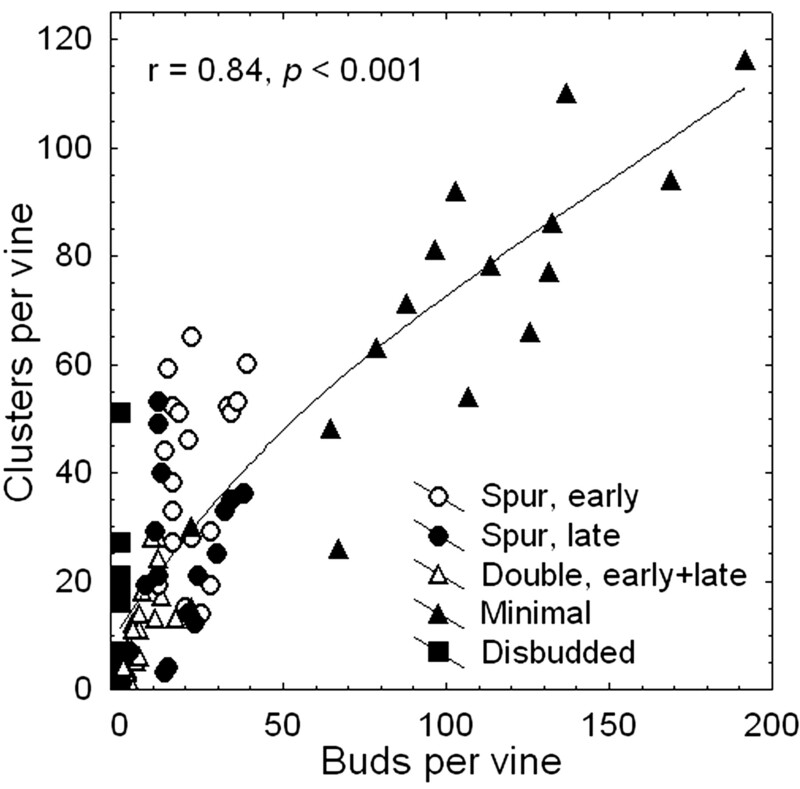 Across the two seasons, increasing numbers of buds per vine were associated with increasing numbers of clusters (Figure 3⇓) and, as a consequence, higher yield (r = 0.86, p < 0.001). The variation in cluster number was the overriding factor contributing to yield variation (r = 0.92, p < 0.001), while berries per cluster (r = 0.57, p < 0.001) and berry weight (not significant) were much less important. Therefore, the pruning treatment had a significant influence on yield formation, predominantly by altering the number of shoots (i.e., clusters) per vine. Minimal pruning led to the highest yields in both seasons, while double pruning and disbudding led to the lowest (Table 1⇑), suggesting that minimal or light mechanical pruning may be a viable and inexpensive strategy to achieve acceptable crop yields in seasons following bud and phloem injury due to unusually low fall or winter temperatures. However, monitoring and maintaining soil moisture during and after bud-break may be critical, as demonstrated by the absence of bleeding and subsequent collapse or stunted growth of vines that did not have access to sufficient soil moisture (authors’ unpublished observations). It is possible that root-pressure-induced rise of xylem sap (see Introduction) may be a requirement for cambium reactivation and phloem recovery of cold-injured vines. Relationship between the number of buds retained using different pruning strategies and the number of clusters at harvest of cold-injured Merlot grapevines. Results were very similar in the two years, and the fruit composition data presented refer to the 2003 season only, which would have been more important in terms of immediate treatment effects and vine recovery (Table 2⇓). In 2003, overall yields were low (mean 2.07 kg/vine or 4.14 t/ ha) and highly variable, probably because of the wide range in cold damage to buds. Double pruning and disbudding resulted in fewer berries per cluster than standard spur pruning (Table 2⇓), likely because the severely pruned vines grew more watershoots and shoots from basal buds. Although its cluster size did not differ from the other treatments, minimal pruning did lead to the smallest berries (Table 2⇓) due to a decrease in berry size with high numbers of clusters and berries per vine (both r = −0.65, p < 0.05). However, fruit composition was unaffected by the pruning treatment, even though total soluble solids (TSS) correlated negatively with yield (r = −0.74, p < 0.01) and berries per vine (r = −0.75, p < 0.01), suggesting that increasing crop levels somewhat delayed sugar accumulation. Nevertheless, the wide range in yield (0.1 to 6.9 kg/ vine) had no effect on titratable acidity (TA), pH, or color. In 2004, grapes were harvested at an average of 26.3 Brix, 5.74 g/L TA, pH 3.35, and color (A520) of 0.79. Again, none of these measures of fruit quality was influenced by pruning treatment. The year-to-year (weather-related) and vine-to-vine (soil-related) variation in fruit composition was clearly larger than that introduced by pruning treatments. 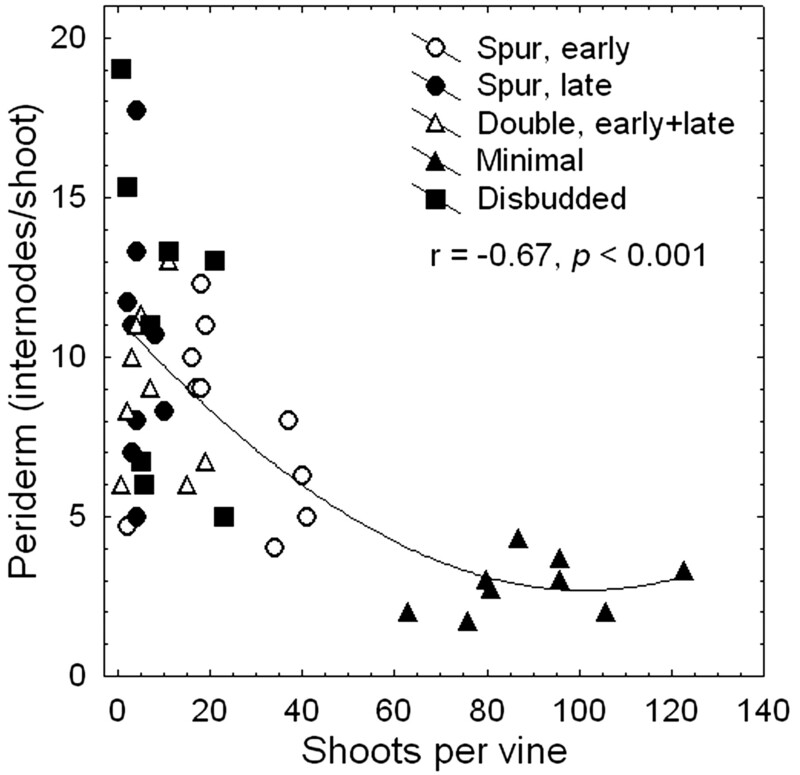 By contrast, there were negative correlations between the number of shoots per vine and both the number (Figure 4⇓) and proportion (r = −0.80, p < 0.001) of internodes with periderm at harvest. The latter relationship was remarkable, because shoot length (i.e., total number of internodes per shoot) also declined with increasing shoot number (r = −0.54, p < 0.001); on average, shoots on disbudded vines had 21 internodes, while shoots on minimally pruned vines had only 13. The periderm percentage also was positively correlated with fruit TSS on the same day (r = 0.66, p < 0.01), indicating that both fruit and cane maturation may have been somewhat limited by assimilate availability. Although the decrease in periderm formation (Table 2⇓) suggests that cold acclimation was delayed (Howell and Shaulis 1980) in the minimally pruned vines, cold damage from low October and January temperatures was as insignificant on these vines as in the other treatments. It is possible that the relatively early harvest (30 Sep) and favorable postharvest conditions (120 GDD in October; Figure 1⇑) enabled the vines to acquire sufficient cold hardiness after harvest. Moreover, the minimum temperature in late October 2003 was almost 3°C higher than in 2002. Nevertheless, the mean number of buds of the nonpruned vines declined by 47% between 2003 and 2004 but was still more than 3-fold higher than the bud number of spur-pruned vines (Table 1⇑). The high number of canes on minimally pruned vines normally compensates for this self-pruning effect (i.e., abscission of nonmature shoot sections) of reduced cane maturation (Clingeleffer 1996). This compensation also ensures that vines continue to produce relatively high numbers of viable buds from one season to another. Incidentally, all experimental vines were restored to the standard two-bud spur pruning after the 2004 season and produced normal crops with little evidence of carryover effects from the various pruning strategies. Effect of pruning treatment and time on cluster yield components, fruit composition, and cane maturation (proportion of brown internodes per shoot) of cold-injured Merlot grapevines (2003 season). Relationship between the number of shoots per vine and periderm formation (number of brown internodes per shoot) by harvest of cold-injured Merlot grapevines pruned using different strategies. The present results suggest that pruning time and bud number may not influence vine survival and recovery following cold injury to the phloem, at least as long as a few latent buds survive. Provided that root pressure can be initiated (as long as sufficient soil moisture is available) in spring, vines seem to be able to rapidly recover from extensive bud damage and repair severe phloem injury. This attests to the resilience of V. vinifera and its ability to overcome adverse conditions, such as cold injury followed by two seasons of enforced disbudding. The response to disbudding suggests that it may be possible to reestablish new spur positions on older cordons with blank sections by simply pruning off old spurs. On the other hand, the finding that nonpruned vines had the highest yields without compromising fruit composition and that they could be returned to spur pruning after two seasons without any significant carryover effects demonstrates that minimal or light mechanical pruning may be a viable, inexpensive, and temporary strategy to achieve acceptable crop yields in seasons following relatively extensive bud damage and phloem injury from very low fall or winter temperatures. However, where actual bud damage is less than expected, this strategy may occasionally raise crop loads beyond the optimum for a particular site, which may require subsequent shoot or cluster thinning. Acknowledgments: Financial support for this work was provided by the WSU Agricultural Research Center, project WPN00428, and by the Washington Wine Advisory Committee program. The authors thank Maria Mireles for measurement of fruit composition. Alleweldt, G. 1965. Über den Einfluss der Temperatur auf die Blutung der Rebe. Vitis 5:10–16. Aloni, R. 2001. Foliar and axial aspects of vascular differentiation: Hypotheses and evidence. J. Plant Growth Regul. 20:22–34. Aloni, R., and C.A. Peterson. 1991. Seasonal changes in callose levels and fluorescein translocation in the phloem of Vitis vinifera. IAWA Bull. 12:223–234. Aloni, R., A. Raviv, and C.A. Peterson. 1991. The role of auxin in the removal of dormancy callose and resumption of phloem activity in Vitis vinifera. Can. J. Bot. 69:1825–1832. Campbell, J.A., and S. Strother. 1996. Seasonal variation in pH, carbohydrate and nitrogen of xylem exudate of Vitis vinifera. Aust. J. Plant Physiol. 23:115–118. Clingeleffer, P.R.1996. Mechanisation of winegrape production in Australia. In Proceedings for the First Vincent E. Petrucci Viticulture Symposium, pp. 39–48. California State University, Fresno. Clore, W.J., M.A. Wallace, and R.D. Fay. 1974. Bud survival of grape varieties at sub-zero temperatures in Washington. Am. J. Enol. Vitic. 25:24–29. Esau, K. 1948. Phloem structure in the grapevine, and its seasonal changes. Hilgardia 18:217–296. Fennell, A.2004. Freezing tolerance and injury in grapevines. In Adaptations and Responses of Woody Plants to Environmental Stresses. R. Arora (Ed. ), pp. 201–235. Hawthorn Press, Binghamton, NY. Fennell, A., and E. Hoover. 1991. Photoperiod influences growth, bud dormancy, and cold acclimation in Vitis labruscana and V. riparia. J. Am. Soc. Hortic. Sci. 116:270–273. Goffinet, M.C.2001. The anatomy of low-temperature injury of grapevines. In Proceedings for the American Society for Enology and Viticulture 50th Anniversary Annual Meeting. J.M. Rantz (Ed. ), pp. 94–100. ASEV, Davis, CA. Gómez del Campo, M., C. Ruiz, V. Sotés, and J.R. Lissarrague. 1999. Water consumption in grapevines: Influence of leaf area and irrigation. Acta Hortic. 493:279–286. Hong, S.G., E. Sucoff, and O.Y. Lee-Stadelmann. 1980. Effect of freezing deep supercooled water on the viability of ray cells. Bot. Gaz. 141:464–468. Howell, G.S., and N. Shaulis. 1980. Factors influencing within-vine variation in the cold resistance of cane and primary bud tissues. Am. J. Enol. Vitic. 31:158–161. Keller, M., L.J. Mills, R.L. Wample, and S.E. Spayd. 2005. Cluster thinning effects on three deficit-irrigated Vitis vinifera cultivars. Am. J. Enol. Vitic. 56:91–103. Lavee, S., and P. May. 1997. Dormancy of grapevine buds—facts and speculation. Aust. J. Grape Wine Res. 3:31–46. Malone, S.R., and E.N. Ashworth. 1991. Freezing stress response in woody tissues observed using low-temperature scanning electron microscopy and freeze substitution techniques. Plant Physiol. 95:871–881. Mills, L.J., J.C. Ferguson, and M. Keller. 2006. Cold-hardiness evaluation of grapevine buds and cane tissues. Am. J. Enol. Vitic. 57:194–200. Pierquet, P., and C. Stushnoff. 1980. Relationship of low temperature exotherms to cold injury in Vitis riparia Michx. Am. J. Enol. Vitic. 31:1–6. Pratt, C., and R.M. Pool. 1981. Anatomy of recovery of canes of Vitis vinifera L. from simulated freezing injury. Am. J. Enol. Vitic. 32:223–227. Priestly, J.H., and A. Wormall. 1925. On the solutes exuded by root pressure from vines. New Phytol. 24:24–38. Salleo, S., P. Trifilò, and M. Lo Gullo. 2006. Phloem as a possible major determinant of rapid cavitation reversal in stems of Laurus nobilis (laurel). Funct. Plant Biol. 33:1063–1074. Schnabel, B.J., and R.L. Wample. 1987. Dormancy and cold hardiness in Vitis vinifera L. cv. White Riesling as influenced by photoperiod and temperature. Am. J. Enol. Vitic. 38:265–272. Schultz, H.R., and M.A. Matthews. 1988. Resistance to water transport in shoots of Vitis vinifera L. Relation to growth at low water potential. Plant Physiol. 88:718–724. Sperry, J.S., N.M. Holbrook, M.H. Zimmermann, and M.T. Tyree. 1987. Spring filling of xylem vessels in wild grapevine. Plant Physiol. 83:414–417. Stergios, B.G., and G.S. Howell. 1973. Evaluation of viability tests for cold stressed plants. J. Am. Soc. Hortic. Sci. 98:325–330. Wample, R.L., S. Hartley, and L. Mills.2001. Dynamics of grapevine cold hardiness. In Proceedings for the American Society for Enology and Viticulture 50th Anniversary Annual Meeting. J.M. Rantz (Ed. ), pp. 81–93. ASEV, Davis, CA. Weyand, K.M., and H.R. Schultz. 2006. Light interception, gas exchange and carbon balance of different canopy zones of minimally and cane-pruned field-grown Riesling grapevines. Vitis 45:105–114. Winkler, A.J., and W.O. Williams. 1945. Starch and sugars of Vitis vinifera. Plant Physiol. 20:412–432. Wolfe, W.2001. Vine and vineyard management following low temperature injury. In Proceedings for the American Society for Enology and Viticulture 50th Anniversary Annual Meeting. J.M. Rantz (Ed. ), pp. 101–110. ASEV, Davis, CA.